Not all bellman carts are made equal. Not when maneuverability is a priority. Over the years, we at Glaro Inc. have found that most carts on the market were hard to push and pull or could only be used from one end. Many carts could not hold heavy loads and still move with ease. Most were difficult to use in tight spaces and around corners. Many carts were responsible for damage to wall, doors, door-frames, and elevators. One thing became clear: conventional carts were creating frustration for building managers and visitors yet no company had solved this issue to date. So, we set out to fix the problem. We tested carts. We looked at imports and domestic carts. And we asked the tough questions. We then took a fresh look at bellman carts. We created a simple goal: design durable stunning bellman luggage carts that are easy to use by anybody anywhere, can maneuver flawlessly with heavy loads, and require almost no maintenance, all at an affordable price. Glaro engineers and craftsmen went back to the drawing board, consulted with facility managers, and responded by developing a way to modify a six wheel bellman cart such that it would become more ergonomic and so easy to use even young children who do not have the strength could safely operate a loaded cart. 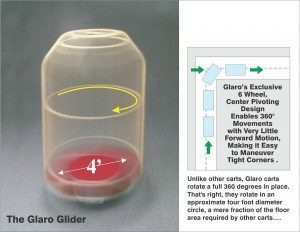 Pinpoint Maneuverability allows Glaro Glider carts to pivot in place, enabling the inner wheels to create an axis that lightens the loads on both ends and redistributes weight so that the cart chassis can virtually turn in place. Weight is smoothly distributed over six wheels instead of two. The result: a lighter feel, more control, and tight steering with unmatched performance. 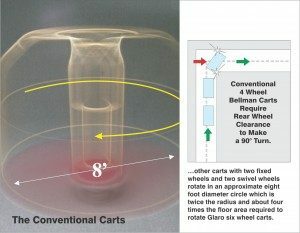 Because of “Pinpoint Maneuverability”, Glaro carts easily maneuver through tight spaces, around corners, and in and out of small elevators. Unlike other carts, you can stand on “either end” of the cart and “push or pull” from either end with a very heavy load. Glaro carts have even been used in theatrical dance productions because they are so easy to wheel on and off stage and can be used as highly maneuverable props. In the end, Glaro carts represent what the company is all about: the customers and an approach to design that embodies the best of both form and function. Anyone interested in a test run can give us a call at 1-888-234-1050 or speak to a customer service representative to answer your questions. As an American brand, Glaro Inc. proudly produces all carts in the USA and ships them in a matter of days as part of its Quick Ship program.